Just in time for Lenten reading and in preparation for the Easter Triduum, Liturgical Press has published Abbot Jeremy Driscoll’s new book, Awesome Glory: Resurrection in Scripture, Liturgy, and Theology. With the clarity of an experienced teacher, Abbot Jeremy offers readers a deep dive into the mystery of the resurrection of Jesus. Starting from the conviction that the liturgy is meant to offer an immediate and effective contact with the resurrection, this profound and beautifully accessible book draws out the liturgical riches of the period from the Paschal Triduum through Pentecost. Abbot Jeremy focuses particularly on the Scripture texts of Mass, but also on important rituals like the washing of feet, and the Lucernarium (Service of Light). Awesome Glory is a beautiful, reflective read for anyone who wants to better understand, teach, and live the startlingly good news of Christ’s Resurrection. 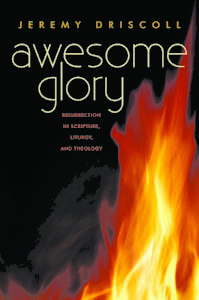 For more information about Awesome Glory, email the Abbey’s bookstore or call 503.845.3345. Awesome Glory is also available on Kindle from major online booksellers. What else do monks read in Lent?